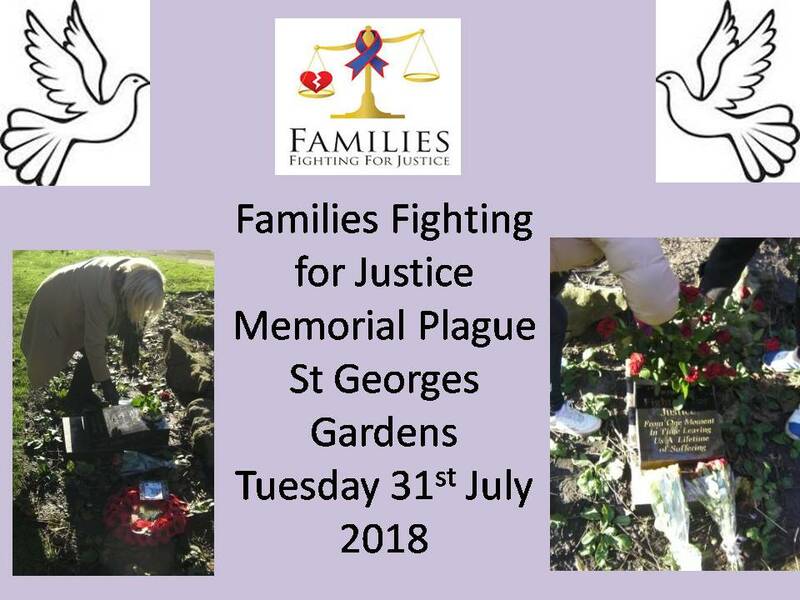 Families Fighting for Justice would like to announce, and invite, all of our past and present members, to our gathering at St Georges Gardens, where we will lay flowers on the Families Fighting for Justice memorial plaque, which is laid there in memory of all the lives taken by acts of homicide or culpable road death. If you would like to walk down as a group please meet at 6 Anson Street, L3 5NY at 10 am (children Welcome). If you would like to meet us there at the gardens at the back of St. Georges Hall please meet at 10.30am. All those that attended the one before, will know how poignant this really is. It would be extremely nice to see some of our old faces, but also, to invite anyone out there, who have lost a loved one in such tragic circumstances. Join us where you will be amongst those who have also lost a loved one. The plaque was laid in St Georges Gardens where the bagpiper played so please join us and let’s draw comfort together.